Consumerism strikes at a young age. Advertising targeted at children is hard-hitting and hard to resist. It’s no wonder that 93 percent of American teenage girls reported that store-shopping is their favorite activity. Here are some tips to teach savvy shopping and money habits to the kids in your life. • Teach money management skills with allowances starting at an early age. Show how money should be responsibly spent, saved, and shared. • Establish a “new thing in, old thing out” system where some purging takes place before buying new clothes, toys, and gadgets. Limit exposure to media so there’s less temptation. • Help high schoolers understand credit cards and how they work. Calculate interest rates so they understand what they’re really paying in the end. • Teach kids to shop with a list and stick to it to avoid impulse purchasing. Know that kids are looking to adults for spending guidelines. If you have good habits, they will, too. • Set up a children’s savings account. Encourage kids to set aside a percentage of their money to save for college, a car, or other long-term purchases. • Help them find a charity that touches their hearts and encourage frequent generosity. • Encourage community involvement, providing a healthy outlet for time and a better understanding of others and their lifestyles. Time to Deal with All Those School Papers! All of the kid’s school papers have been piling up on your counter all year. Now what should you do with them? This seems to be one of the greatest sources of anguish for parents we are organizing today. Kids bring home so many papers from school every week and as parents, we are torn with which ones to keep and which ones to toss. So, we just stick them in a cabinet to deal with "later" or let them collect on the kitchen counters. Later finally comes when we run out of empty places to shove things or when we decide to take action. Luckily, end of the school year is a great time to spring into action. We are here to jump start you by putting together some guidelines to use when you are going through the school papers and whittling things down. Next, go through each paper. For worksheets- keep that special one where they finally got a 100 on. Don't keep every worksheet they have ever done. For journals and writing papers- these are a great thing to hang onto because they give you a snapshot into what their little minds were thinking at the time. (Especially those stories from kindergarten when they used their creative spelling!!) Love those memories! The next category we have is the art work. Let's be honest- not every paper they have drawn is their best work. Sometimes it really IS just a scribble! In other instances, they have spent considerable time on it. Choose the ones that show their creativity at its best. The paper plate with the nose and eyes glued on is not as creative as the one that shows the child's interpretationof the family on a trip together. Once you have gone through each paper put it in one of the bins with a label and the child's name on it. Here are a few other great options for storage ideas. Keep one of the bins in your child's room to make it easy throughout the year to add to it. Next year, at the end of the school year, spend some time emptying out their backpacks and putting the special items in their keepsake bins. Now that you have finally dealt with all those school papers- it's time to enjoy your summer! School's Out! Let's get organized! So the time is finally here. School's out!! For some parents this time can be more bitter than sweet. We have all been there. The last few days the papers start trickling in and then BAM, their entire school desk is unloaded on your kitchen counters spilling over into their bedrooms and then the stress starts mounting. If you have more than one child like me, that means several desks of paper! Not the stress free way that you thought summer would begin! Here are a few tips to get the paperwork under control quickly. First, keep the pile contained to one area. Talk with your children and help them decide what is really important. (I know at first they will say everything! Ha!) Help them choose their BEST art work, writing piece, report cards, photos, and any other important awards etc. Grab a garbage bag and discard the rest. Have them VERY involved in the process so no resentment is caused! Next, have them help you file it. 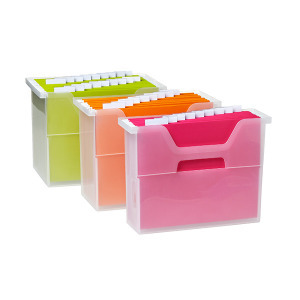 I picked these handy filing containers up at Aldi of all places! They are the perfect size for handling the small amount of filing that is left. Label the tabs and outside of their box. My kids get so excited that they file everything on their own now. They also love looking back in their containers at their "organized" school work from past years. This one single container should be a perfect size through HS. Remember you are keeping their BEST work! Don't delay! Get this task done and feel the stress melt away!